Individual Tickets now on sale online. Special 25th anniversary giveaways and bobbleheads highlight the Danville Braves 2018 Promotional Schedule, which features fan favorites from past seasons such as weekly promos and fireworks, as well as new promotions for 2018, including an anniversary card set and shirsey giveaways. Tickets are now available for all games and events online at dbraves.com/tickets and by calling 434.797.3792. The promotional schedule kicks off on Opening Night, Tuesday, June 19, with the traditional magnet schedule giveaway. On Friday, June 29, the giveaway promotions continue with a Danville Braves' 25th anniversary card set presented by Riverside Health & Rehab. The D-Braves will also feature a Danville Braves shirsey giveaway presented by Piney Forest Health & Rehabilitation Center on Aug. 16. The team will also wear throwback Danville 97s jerseys for Centra Cancer Awareness Night on Aug. 11. Following the game the game worn 97's jerseys will be auctioned off online to benefit the Centra Foundation and Danville Cancer Association. Bobbleheads return to the D-Braves promotional schedule with a Ronald Acuna bobblehead giveaway on July 21 presented by Comfort Inn, and a Chipper Jones bobblehead giveaway on August 18 presented by Danville Toyota. The D-Braves July 3 matchup against Bristol will feature post-game fireworks in celebration of Independence Day. 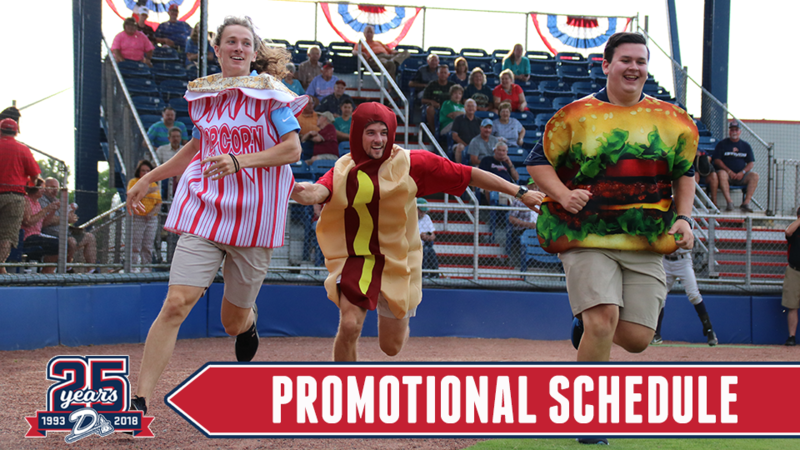 The promotional schedule also features the return of three Faith Nights (July 1, July 23 and Aug. 10), as well as Educator Appreciation Night (June 28), Goodwill Night (July 19) and First Responders Night presented by LeBleu (Aug. 9). The annual DARE Day game presented by Inframark will be held on Aug. 22, with the promotional schedule wrapping up on Aug. 23 with Fan Appreciation Night. Popular weekly promotions make their return in 2018, including Dollar Monday, $2 Tuesday, and Thirsty Thursday. Kids Free Wednesdays also returns, with all kids 12 and under able to receive a free ticket with a paid adult admission. Dollar Monday will once again feature $1 hot dogs, souvenir sodas, and popcorn. $2 Tuesday will allow fans to purchase $2 general admission tickets (excludes July 3), tallboys, hot dogs, corn dogs, and french fries. Fan favorite Thirsty Thursday will again feature discounted fountain and draft beverages. To view the complete D-Braves promotional schedule and purchase tickets, visit dbraves.com. The Danville Braves are the Rookie (Advance) affiliate of the Atlanta Braves. The D-Braves began play in 1993 and will celebrate their 25th anniversary during the 2018 season. The D-Braves play in the Appalachian League, which consists of 10 teams across North Carolina, Tennessee, Virginia, and West Virginia. For more information about the Danville Braves, please visit www.dbraves.com or call 434.797.3792. You can follow the D-Braves on Twitter, Facebook, Instagram, and Snapchat. This story was not subject to the approval of the National Association of Professional Baseball Leagues or its clubs.